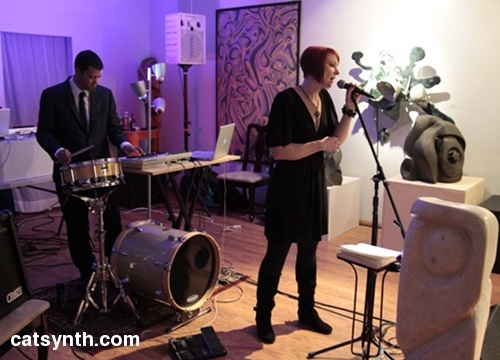 The Omega Sound Fix gets underway tonight at the Alfa Art Gallery in New Brunswick, New Jersey. I am planning to be present tonight as well as tomorrow and as with other larger music and events I will be probably be live tweeting @catsynth. I have been busily preparing for the performance (along with everything else one does for a long-distance trip). 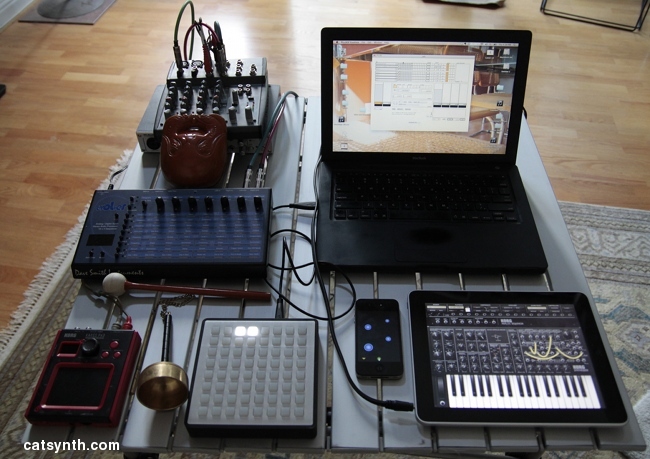 The basic setup features the iPhone, iPad, MacBook, monome, DSI Evolver and Korg Kaoss Pad. The iPhone will primarily be running Smule Ocarina, while the iPad will be used for the new Smule Magic Fiddle, the Korg iMS-20 (pictured) above, the Bebot, and sundry other instruments. 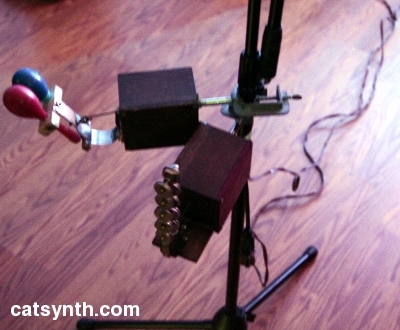 One thing I have noticed is that although the main musical items have shrunk in size, the entire rig remains large, primarily because of the ancillary elements such as cables, stands, etc., so it ends up still being quite cumbersome and heavy, especially when loading it into airline-friendly suitcases. I ran into similar challenges with previous performances in New York as well as the one in Shanghai last year. The first is a dotara. Although the name implies two strings, this instrument actually has five. I have not played it before, so we will see what happens. The second is a new gophichand. My other gopichands are fine, but it’s nice to have a few (if only as spares, as they are quite delicate). I will be freely mixing them with Chinese percussion instruments as well as my iPad-based model of a Chinese guzheng that I first used at the Luggage Store Gallery in September. I like the idea of mixing elements from different traditions together into something new. Over twenty innovative international and local musicians will perform at the bleeding edge of sound on Nov. 20 & 21 at Omega Sound Fix. Headlining performers have performed with the likes of John Cage, David Tudor, Steve Reich, Lydia Lunch, Faust, and Throbbing Gristle and are exploring new territory this fall. Richard Lainhart is an award-winning composer, author, and filmmaker renowned for his individual work and collaborations with John Cage, David Tudor, and Steve Reich. His compositions have been performed worldwide with his earliest sonic forays predating Brian Eno’s ventures into ambience. Philippe Petit of Marseilles, France is an innovative composer, who considers himself a “musical travel agent,” and assembles “sound-images” with turn tables and digital wizardry. He has performed across Europe and the Americas with Lydia Lunch, Faust, and Throbbing Gristle. Octant, a one-man and multi-robot band, will plumb the depths of cybernetic accompaniment on Sunday, Nov. 21. Mathew Steinke serves as the band’s Gepetto and sole human member. 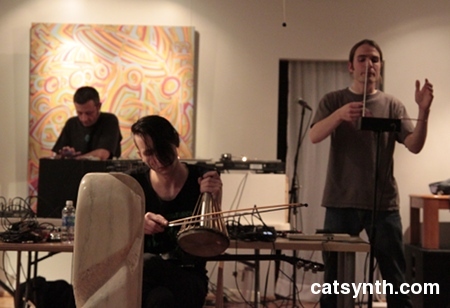 “I would go out of my way to see an Octant show…” writes CMJ magazine. Tickets are $6 for one day, $10 for a two-day pass. Doors open at 6 p.m. on Saturday and 4 p.m. on Sunday. Local musicians, Mike Durek and Mark Weinberg, spawned the idea of an innovative and eclectic music festival during a mini-golf match last summer. Durek and Weinberg expressed frustration with the lack of a new music scene in New Brunswick and sought to fill the void with innovative sounds and talented performers. Click here for more info.